Technology brings amazing products to our doorsteps, but unfortunately, deterioration is part of any scenario. When it comes to your garage doors, you must make sure all parts are well looked after. Proper maintenance of your garage doors has many benefits. Firstly, your door will work well. Secondly, it will last longer and make less noise. 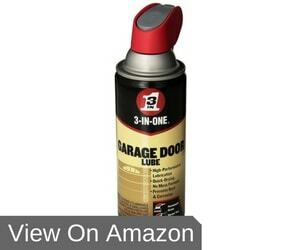 This review helps you pick the best garage door lubricant for your home. A well-developed product, both in its content and the container. The quick drying formula prevents build up and stickiness. A Teflon enhanced lubricant that can easily be sprayed onto any surface, thanks to the well- designed nozzle and straw attachment. 60 years of experience at WD-40 results in this product which dries quickly, but still lubricates well. It’s functional for home use, as well as industrial areas. The manufacturers of this 3-in-one door lube thought about everything. You don’t have to be concerned about a huge mess whenever it’s time to maintain your garage door. Even the design of the bottle, which has a hinged straw, is specifically designed to assist you in having a clean lubricating process. In addition, this type of lubricant is a quick-drying substance. If the lubricant doesn’t stay wet for a long time, you can instantly start using your door again, without fearing that residue will form. The lubricant will protect the mechanisms, but not make them sticky to touch. Users of the product love how the thin straw helps to spray hard-to-reach places. Unfortunately, the drying feature means it’s not as lubricating as some grease products. This well-engineered product has Teflon as part of the ingredients. This means it not only helps parts move easier but also protects them. The focus is to offer users a lubricant that won’t cause build up. Dust particles aren’t easily attracted to this item which is in the running for the best silicone lubricant. 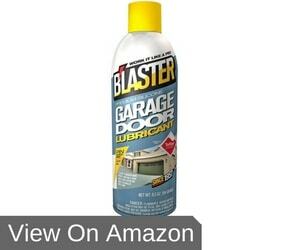 Some users are unsure how to lubricate garage doors with this product because the fluid is quite runny. Therefore, you can’t apply a thick layer in places that need more lubricant. WD-40 Garage Lubricant is well-known for a reason. It offers most of the characteristics you’re looking for when doing maintenance. This includes different spray options with a straw attachment for hard to reach places. 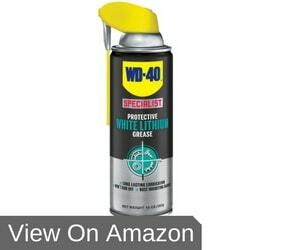 WD-40’s consistency prevents it from running, so you’re left with well-lubricated garage door parts. 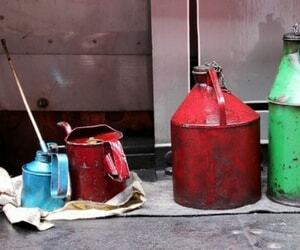 Apart from lubricating, it also protects metal from rusting. It is practical in any environment and climate, as it’s can handle temperatures from 0-300°F. The company may want to develop the spray nozzle further, as some users complain about its durability. Many feel when it comes to garage door lubricant, lithium is a must. For these people, this product is perfect. Some users find it too runny, as they prefer foam. Knowing what to look for makes it easier when choosing a garage door lubricant. Here are some questions you should ask. Silicone is important because it prevents dripping. It’s also ideal for parts that move against each other, so causing friction. This is known to stay on parts longer than some other substances. When weighing silicone vs lithium, garage door types are a practical starting point to consider. Each door’s design is different. If you have a door with many moving parts that are used daily, silicone may be the way to go. However, doors that are seldom used may require lithium substances. The benefit is that you don’t have to visit the venue often to maintain the door. This is excellent for storage spaces. You don’t want to lubricate your garage door every weekend right? Make sure you purchase products that will last long. This means it must stick to the appropriate surfaces and maintain its structure as a protective layer on all parts. Lube can’t be a simple liquid—it must have a thicker consistency. This results in it sticking to surfaces instead of running down. High-quality lubes dry quickly, but it still needs a few minutes to set. Therefore, a thicker consistency—not greasy, though—is ideal. When choosing a garage door, lubricant silicone or lithium types can be beneficial. However, out of all the items mentioned here, the DW-40 specialist lithium lubricant comes out on top. The company’s years of experience results in a product which clings to metal parts, rather than simply running off. The best garage door lubricant must protect as well as lubricate, and this is what DW-40 does. Its expert formula is available at an affordable price, so keeping your doors working is now easy for you, as well as easy on your budget.